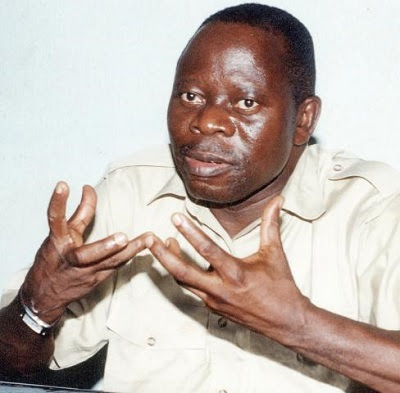 Comrade Adams Oshiomhole, national president of the All Progressive Congress in power (APC), allegedly orchestrated the siege of the seats of Bukola Saraki, president of the Senate, and Ike Ekweremadu, vice president of the Senate on Tuesday. A key member of the reformed PCA (R-APC), who spoke Wednesday with an independent correspondent, said Oshiomhole in his attempt to facilitate the removal of Saraki and Ekweremadu and to prevent a possible defection of the legislators of the PCA. the national party president to order the police to barricade the homes of Saraki and Ekweremadu to prevent them from going to the National Assembly. However, he said that Saraki, who has police informants, got wind of the plot a day before (Monday) and he, along with some key leaders of the PDP, including a prominent governor of the South-South improved plans for He did not sleep in his junction of Lake Chad, Maitama's residence, and also helped him to gain entry to the National Assembly on Tuesday, thus counteracting the impeachment plot. "I am a key member of R-APC and I know what is going on." Oshiomhole, APC's disputed national president orchestrated the plot, "I'm sure President Buhari is not even aware of the development. "Having failed to convince the belligerent senators to suppress their sword, Oshiomhole, in his characteristic combative manner, as a former union leader, used his influence to get security agents to orchestrate the siege of the houses of Saraki and Ekweremadu I wonder why the police deny that no seat has ever been held even when it is recorded and broadcast live on national television. But for some key informants who revealed the plot to Saraki, he would have been indicted now, "he said. Already, the Nigerian police have denied sending a detachment of his men to the residence of Bukola Saraki, the president of the Senate. A detachment of security agents had blocked Saraki's convoy in his residence in Apo to prevent him from leaving the house. But he then announced that the residence of Ike Ekweremadu, his deputy, had also been besieged by police and state service department (DSS) men. Police also denied that his agents had cordoned off the home of Senate Vice President Ike Ekweremadu in an attempt to arrest him. In a statement on Tuesday, police spokesman DCP Jimoh Moshood also insisted that "the force wants to categorically assert that there is no authorized deployment of police to besiege the residence of the President of the Republic. Senate or his deputy ". "